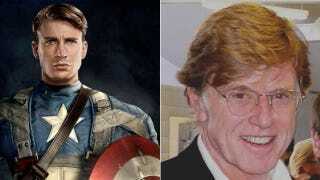 The Hollywood Reporter reports (in Hollywood, presumably) that super-acclaimed actor/director Robert Redford is in talks to join the cast of Captain America 2: The Winter Soldier. The word is that he'll playing a S.H.I.E.L.D. officer — presumably one who hangs around with Sam Jackson's Nick Fury — and that it could be a role that might extend to other Marvel movies. Not that the Marvel superhero movies need any credibility anymore, but if they did, getting Redford on board would do it. Moreover, I think we can safely assume that Redford wouldn't take the role if he weren't excited about the movie for some reason, because it's not like he needs the money or anything — and he's pretty damn picky about his projects nowadays, too. My point is, I don't know if anyone has been particularly worried about Captain America 2, but if you were, I'd say you can stop now until further notice.